Too much glare can be a serious issue for a work environment like a school, library, or office building. In these types of places, people need to be able to see without disruption so they can work comfortably and stay productive. But no one wants to stare at closed blinds for eight hours a day; you need to be able to see outside and enjoy the sun. The solution? Glare reduction window film for your Dallas building. Everyone wants and needs sunlight. Being able to experience the warmth of the sun is important for our bodily and mental health. But, at the same time, we all have responsibilities that we have to attend to and too much sun can create glare that makes it practically impossible to study or work on a computer. Glare can cause all types of problems, from eye strain to fatigue, and put a damper on your day to day tasks. By installing glare reduction window film, you can help your employees stay more focused throughout the day by eliminating harsh glare in your office. Enjoy the sun without putting your employees under the stress of dealing with glare. Most people instinctually get up and close the blinds or draw the curtains when there’s too much glare. But what if you didn’t have to deal with the nonsense of getting up and sitting down all day long and could actually enjoy the beauty of the sun? With glare reduction window film in Dallas, you can! Glare reduction window film uses spectrally selective technology to isolate light frequencies that cause glare. Beautiful, soothing visible light is allowed through the film while uv radiation is prevented from entering. The result? A bright, yet glare free environment that allows your employees to perform up to their full potential and thrive. 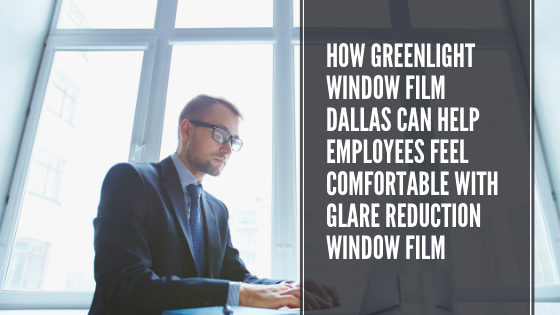 Discover solutions for reducing glare in your office, school, or building with Green Light Window Film Dallas. Call our team today to book a consultation appointment.